Here is a question I posted to a forum. I am going to repost it and one of the responses that I received. Start with $600 in chips. 20 min. rounds. Rebuys during (the first) four limits, no rebuys after. A rebuy will get you $800 in chips (2 rebuys max). At the end of the first (4) four limits ("the break") it is the last chance for any rebuys. I have $1,800 in chips (an upper medium stack), and both rebuys left available to me. (After the break) the limit is going to be $200-$400, with $100 small blind and $200 big blind. significant amount (Tournament Tips from the Pros by Shane Smith, 1992). I wish I had a more concrete answer such as a %. One rebuy of $800 is equal to almost half my chips, is that significant? 3 tables left. Payout to final table (9 places). I had one of the bigger Medium stacks. Everbody was making both rebuys if available. I decided to take one rebuy of $800 increasing my stack to $2,600. I felt another $800 was only about 1/3 of my chips and was not warranted. I raised/stole the first two pots netting me $600 almost the amount of a re-buy. They say "Bulldog" Sykes (had a) theory that he'd just get his re-buy chips from the other players. never really mattered this time, except that my entry fee was now… double (which cut into my overall win). Perhaps a % amount that makes an add-on worthwhile. Rebuy is $15 for T800, or over T50 per $1. These chips are quite a bit cheaper than the original ones you bought, and this argues strongly for making rebuys. Another big factor is your stack size. As has often been said, the more chips in your stack, the less each one is worth. The fewer chips you have, the more each one is worth. Thus, if you are short-stacked, always rebuy, no matter what the blind structure is at that point. If you feel that it is too expensive given that you're only buying enough chips to maybe play one hand, then the tournament was too expensive to enter in the first place. >I wish I had a more concrete answer such as a %. >One rebuy of $800 is equal to almost half my chips, is that significant? Given the discount price you were getting, I'd rebuy/addon anytime the new chips increased my stack by at least 25-30%. If the increase is less than 25%, then I'd opt not to take it. If the chips were even cheaper, I would addon anytime my stack increased by some even lower percentage (e.g., if the rebuy were T1000 for $15, I might rebuy anytime my stack would increase by 15-20% or so). In another example, if the rebuy chips are the same price as the original chips, I usually only rebuy if the stack increase will be by at least 50%. In summary, I'd have done the same as you. Just for different reasons. Remember, if the rebuy or add-on chips are especially cheap, like half-price or less, always take maximum rebuys and add-ons (unless the rebuys are unlimited, at which point take them until the next rebuy won't increase your stack more than about 10%). Again, if you feel that this is too expensive, then the entire tournament is too expensive. Also, the total amount invested isn't of any importance when making a rebuy decision. What you've already spent is gone. The only question is "if I spend this additional $, will my expectation increase by more than that $ amount?" Anytime the answer is yes, rebuy. Even if you've spent a million already, if the next $ amount you spend will increase your expectation by (more than that investment) then taking it is a good bet. 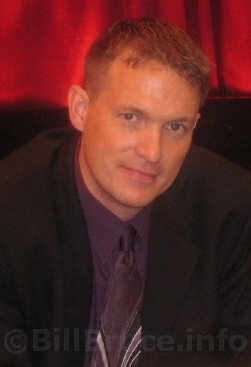 Greg Raymer would go on to win the 2004 Main Event at the World Series of Poker.